Lily-of-the-valley is a favorite groundcover for woodland gardens as it does well in light to moderate shade and rich slightly acid soil. Delightfully fragrant when they bloom in the spring, they will naturalize to cover a large area with rich green that will last until August in this area. 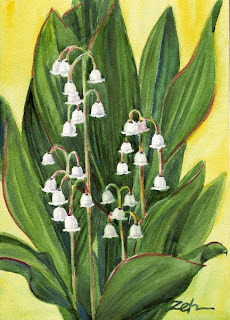 I like how the tiny bell flowers stand out against the dark green leaves in this painting.